Starfish is a perfect Kiwi bach on the beach, any time of year. Feel the sand under your toes and let the stress of daily life slip into the waves. Let go of deadlines and schedules as you adapt to the rhythms of the tides, relax your mind as the sounds of the sea lull you to sleep. This traditional kiwi bach has been decorated with colour and love - highlighting local artists and artisans, creating a laid back holiday vibe. The comfortable lounge, with its cathedral ceiling, is just right for board games around the handmade macrocarpa coffee table, cosying up with a book on the upholstered rocker, or watching movies on the flatscreen TV. The kitchen is tiny but well equipped, perfect for a real holiday for the cook. Take your meals at the dinning table in the sunroom, looking out to sea watching the gannets dive, or outdoors on one of the two picnic tables. (The sun umbrellas may be in the garage). The Queen bedroom's romantic French doors open onto a covered deck, and you can sit up in bed and watch the sun come up, right out of the sea. The sunny bunk room has two sets of bunks, with feather duvets on all the beds, and lots of extra wool blankets and pillows in the closet. At Starfish, enjoy lazy days sunning, swimming, and playing on the beach, and long walks along the tideline. Along the beach to the north you can see oyster catchers and godwits roosting on the sand during the summer months, and black swans grazing on sea grass when the tide is high. Peaceful Pakawau beach is on the northern side of Golden Bay, sheltered by the 35 km long arm of Farewell Spit. When you want to go exploring, there's beaches, caves, cafes and artists' studios, all nearby. A contrast to gentle Pakawau Beach is nearby Wharariki Beach, with its wild west coast breakers rolling in, lots of caves, sand dunes and tidal pools of playing seal pups. Farewell Spit, by foot or safari, is a bird watchers dream, with over 90 species recorded there, and there's a cafe at its base with good binoculars and a display of the interesting history of nearby whale strandings. Take a walk through green sheep dotted paddocks, ancient macrocarpas and virgin coastal bush to Fossil point at the base of the Spit's 35 km long wide sandy beach. Right in Pakawau, the camp shop is open again for icecreams, bait, and essentials, and the Schoolhouse Cafe is just across the road. Pop into Collingwood to the Courthouse Cafe for a delicious breakfast, or check out a live Gig with dinner and a house made brew at the Mussel Inn. In winter, cozy up around the woodstove and enjoy our collection of board games and our wide selection of DVD's. The huge old macropcarpas across the road block the famed Pakwau westerly wind beautifully: so Starfish and its beachfront are a pool of calm. (Thank you to the trees and the farmer who lets them remain). For when you need to connect, the cell phone coverage is good in the sunroom. Play your own favorite tunes through the stereo, and relax! CLEANING: our housekeeper can clean for you (NZ$70), or else, in Kiwi bach tradition you have the option to clean the house yourself before you leave. I grew up at Kina, near Motueka, and attended Tasman school with lots of cousins. We had an apple orchard and ponies to ride on the beach - so idyllic! Though my extended family stayed in the district, I moved to Australia in my 20s, and met my American husband while kayaking down the Murumbidgee. After living in the US for many years my three children and I returned for a year in NZ in 2002, so they could get to know their kiwi roots. We found Starfish that year, and have been thrilled to have it as our base in NZ ever since. Our youngest daughter has lived in NZ for the last 5 years and our son lives in Sydney, and we spend as much time as we can at Starfish. We hope to spend 6 months of each year there in a few years. We are happy to share this beautiful piece of paradise with our guests. Many come back year after year and love it as much as we do! As a young child I remember the excitement and delight at being included in my father and uncles white baiting trips to Anatori - further down the west coast from Pakawau. We would drive all the way from Tasman, sometimes staying for a few days in Paturau during the white bait season. We would always drive through Pakawau to get there, so when I started to look for a place in Golden Bay in 2002 I was drawn to the west side of the bay, its beautiful calm beaches and proximity to the wildness of Whaririki and my much beloved Anatori. My husband and children and I camped at the Pakawau motor camp, Easter 2002. We did the Spit tour and fell in love with the remoteness and beauty of Pakawau. The front gate leads right onto a lovely safe swimming beach, a perfect playground for families. Take a short scenic drive, and a 15 min walk through green sheep studded pasture and rolling dunes to wonderful Wharariki beach, with its wild ocean and gigantic caves. 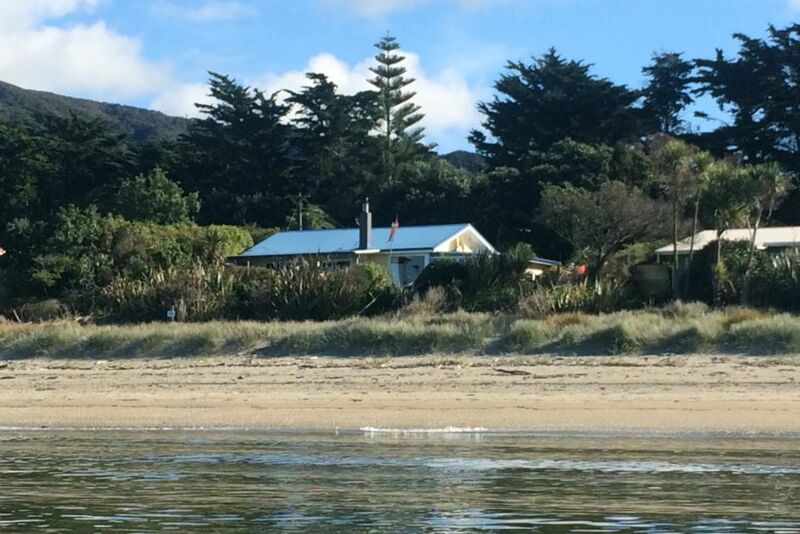 Absolute beach front - just go through the garden path and right onto sandy Pakawau beach. Well equipped - enough for Christmas dinner for 6!! A varied collection with local authors, adventure, historical fiction, self help and lots of old Readers Digest condensed! This an absolutely stunning little cottage with direct access to a beautiful beach. You wake up to the sound of waves and wish you could stay longer in this magical place. We’ll definitely want to come back. Very relaxing . Ideal location to explore from or just do nothing . Wonderful stay. Had everything we needed and more! Great owners, very accommodating. So glad you came back to stay again. It is a pleasure to have you at Starfish. Thank you! Lovely bach..fabulous spot..right on the beach..didn't actually spend much time in it as staying for my daughters wedding at the Pakawau Beach Camp so spent most of the weekend there. However the queen bed was SO COMFORTABLE! We slept so well! Love to stay again sometime..in summer. Well cared for and equipped. Lots of nice personal touches. Owner fantastic to deal with, very accommodating. We will be back! We enjoyed a fantastic stay at this classic Kiwi bach. A fantastic location with the beach literally on the other side of the garden gate. A beautiful sandy beach too - very safe for the kids. All the facilities you need. Highly recommended. So glad you had a fabulous time at Starfish, and got to enjoy our lovely spot.